The HP quality keypad allows you to minimize unwanted key presses with large, soft-edged keys and generous key spacing. Two shift functions. Auto power off after 10 minutes. The HP 10bII is the smart choice for business and finance needs. You'll be able to work quicker and more efficiently with over 100 time-saving, easily-accessible business functions. Easily calculate loan payments, interest rates and conversions, standard deviation, percent, TVM, NPV, IRR, cash flows, and more. Because it works in algebraic notation, it's easy to learn and use. 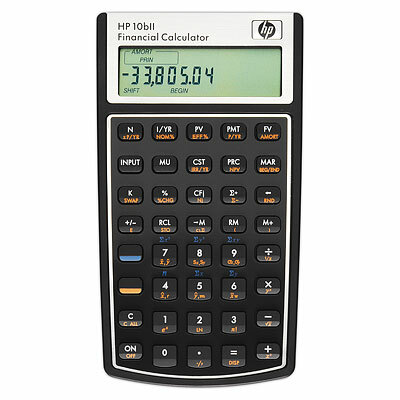 With so many useful features, and an affordable price, the HP 10bII adds up to a wise investment. Permitted for use on the CFP Certification Exam. Refurbished units when listed have been individually tested by one of our experienced staff and come with a 90 day warranty through us. They include calculator, case, and batteries.